Janoski’s Farm typically picks the first of its sweet corn the first week of July, just in time for Independence Day cookouts. So imagine customers’ delight when they discovered heaps of silk-topped ears in the Clinton farm market on June 16 — roughly three weeks ahead of schedule. Doesn’t the farmers’ axiom have summer’s favorite veggie only knee-high this early? It’s so early, in fact, that many shoppers were just as surprised as the farmers. At Kaelin Farms in Franklin Park, where the daily harvest began on June 23, or about 10 days ahead of schedule, sales were uncharacteristically sluggish the first three or four days corn was available. The first tender ears also arrived earlier than expected at Schramm Farms in Jeannette, Westmoreland County, where white and butter-and-sugar varieties are selling for $6.50 a dozen. Staff there started picking on June 27. Overall, it’s shaping up to be a pretty good year for local corn in Western Pennsylvania, thanks to a mild winter and the warmest March in Pittsburgh meteorological history (the average temperature was 51.5 degrees, and there was one four-day stretch where it reached into the 80s). Those ideal conditions means farmers were was able to sow the first of their butter-and-sugar (bi-color), yellow and white varieties even before St. Patrick’s Day, and see the first green shoots before Easter. “Last year, we didn’t even plant until April 7,” said Mr. Kaelin. 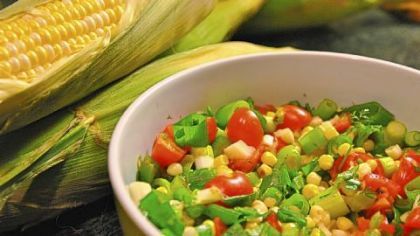 All this is good news for those among us who can’t imagine a summer that doesn’t include salty, buttery ears of corn on the cob, corn salad, corn chowder, corn relish, corn pudding . . . . Whether this early bounty will continue into the dog days of summer depends on the weather. Corn gets replanted into July so the crop continues into early October. While it loves sunny, hot weather, it also loves (and needs) water. So even farms that irrigate are hoping for stormy skies in the next few weeks, even if it ruins the picnics and barbecue at which the cobs will be eaten. “Definitely, the lack of water is an issue,” said Ms. Janoski. Mr. Kaelin, when I caught up with him last week on his cell phone, was busy moving irrigation pipe into his family’s corn fields, and he agreed, “It needs to rain.” And not just because the plants will wither in dry conditions. When it gets hot and dry, he said, wildlife start searching a little harder outside the woods for something to eat — and there’s not much you can do to keep deer out of a cornfield that’s kept green by irrigation. So here’s hoping for a few drenching rainstorms. 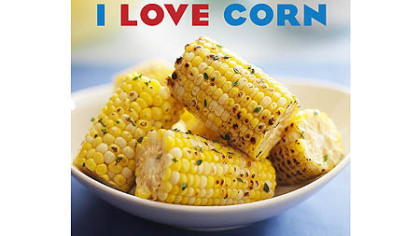 In the meantime, here are some quick and easy recipes that celebrate the cobs and the kernels. Worth noting: The sugar in corn’s kernels start changing to starch almost as soon as you pick it (40 percent within six hours), so for best flavor, try to eat corn the same day you buy it. If you must store it, place it with husks still on in a plastic bag in the refrigerator for up to two days. You might not immediately make a love connection between curry and corn, but they actually pair really, really well in this Thai-inspired fritter. Do yourself a favor and double the relish, which I made with pickling cukes I picked up at the Market Square Farmers Market — you’ll want to spoon it on top of burgers and hot dogs. You’ll find rice flour in your grocer’s organic section. Make relish: Combine vinegar, sugar and salt in a medium-size saucepan over medium-high heat and cook until sugar dissolves. Remove from heat and let cool slightly, about 10 minutes. Add cucumber and shallot. Refrigerate for 25 to 30 minutes, until pickled. 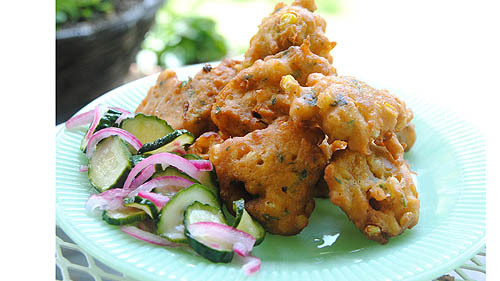 Make fritters: In a medium-size bowl, mix curry paste, eggs, coconut milk, rice flour, coconut, salt and sugar. Fold in corn, then cilantro. Heat vegetable oil to 350 degrees in a deep fryer or medium-size deep pot. Use a medium-sized spoon to scoop 4 to 6 rounded tablespoons of corn batter into the oil at a time to avoid overcrowding. Fry until golden, 2 to 4 minutes each, turning frequently to cook evenly. Transfer the fritters onto a paper towel-lined plate to drain. Season with salt. Serve hot with cucumber relish. Serves 4. Prepare the corn: In a small bowl, whisk together the corn oil, chili powder and salt. Rub corn all over with the mixture. Wrap corn in aluminum foil and grill it, turning often with tongs, for about 25 minutes. Remove foil and finish grilling right on the grates, about 5 minutes. OR peel back the husks, remove the silk, season the corn, then pull the husks back over the kernels before grilling for a nice smoky flavor. Meanwhile, make the sauce. In a medium-sized bowl, combine all the sauce ingredients. Slather the grilled corn with the mayonnaise mixture and serve at once. Serves 4. This quick-cook salsa is a good topping for fajitas or tacos, but beware: it’s spicy. It’s ideal for late summer, when both tomatoes and corn are at their peak. Heat a large, dry cast-iron skillet over medium-high heat. Add garlic cloves and jalapeno and let them cook undisturbed until tinged with black, turning them 2 or 3 times. Transfer garlic and jalapeno to a cutting board, and add corn. Cook, stirring frequently, until kernels are speckled brown and fragrant. Transfer corn to a medium mixing bowl. Peel garlic and chop it finely. Seed jalapeno if you prefer milder heat and chop it finely. Gently toss with corn. Add tomatoes, scallions, cilantro, lime juice and salt and toss well. Taste the salsa for lime juice and salt and serve it at room temperature. 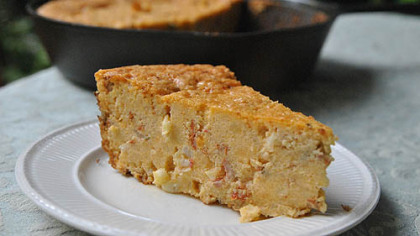 If polenta and a cornmeal souffle had a baby, I’ll bet it would look and taste a lot like spoon bread, a rich, creamy cornmeal pudding that originated more than a century ago in the South. This modern version from Martha Stewart gets extra flavor with onion and spicy sausage. I substituted bulk Italian sausage for the chorizo, which gave the dish a pinkish color, but you also could leave the meat out completely if you want to go vegetarian. Heat 2 tablespoons butter in a medium skillet over medium heat. Add onion and cook, stirring occasionally, until softened, about 4 minutes. Add chorizo and saute until onion is soft and chorizo is lightly browned, about 4 minutes more. Drain excess fat and transfer mixture to a medium bowl and let cool. Preheat oven to 350 degrees. Bring water to a boil in small saucepan. Slowly pour in cornmeal, stirring constantly. Reduce heat to medium-low and cook, stirring, until thickened, about 2 minutes. Add to sausage mixture. Stir in corn kernels, salt and remaining tablespoon butter, and combine well. Whisk together eggs and cream. Stir into sausage mixture until incorporated. Pour into a buttered 2-quart souffle dish or deep-pie plate. Bake until set and top is golden brown, about 1 hour. Serve hot or at room temperature. Serves 8. Heat oil in saucepan. Add onion, celery and garlic; saute until onion is translucent. Stir in broth, salsa, corn, cumin, curry and tortilla chips. Bring to boil; cover and simmer 5 minutes. Stir in cream-style corn, salt and pepper. Heat briefly. Garnish each serving with a dollop of sour cream or yogurt.